Use our attorney-drafted Lease Renewal to extend the term of an existing Lease Agreement. The Basics: What is a Lease Renewal? 2. The Basics: What is a Lease Renewal? A Lease Renewal Agreement is a written document that extends the term of an existing Lease Agreement between a landlord or owner of a property and a tenant or renter of the property. The lease extension modifies the expiration date of the original Lease Agreement, and possibly the amount of rent, but the terms of the Lease Agreement otherwise remain the same. Landlord: The name and address of the party who owns the property. Tenant: The name and address of each tenant leasing the property. Property: The address and details of the property being leased. Lease Agreement: The name and date of the original agreement. Renewal or Extension: The beginning and end dates of the new lease term. Rent: Whether the amount of rent will change or will stay the same. Full Force and Effect: The lease agreement will otherwise remain in full force and effect. Counterparts: In case the parties are not in the same location, they can sign the agreement in counterparts. Governing Law: Which state’s laws will govern the agreement. Signatures: The landlord and all of the tenants need to sign the extension. Wondering how best to negotiate your Lease Renewal Agreement? Here are 7 helpful tips from Forbes. The sample lease renewal below details an agreement between the landlord, ‘Martha E Banks’, and the tenant, ‘Nancy A Eng.’ Martha E Banks and Nancy A Eng agree to extend the term of the lease beyond the original termination date. 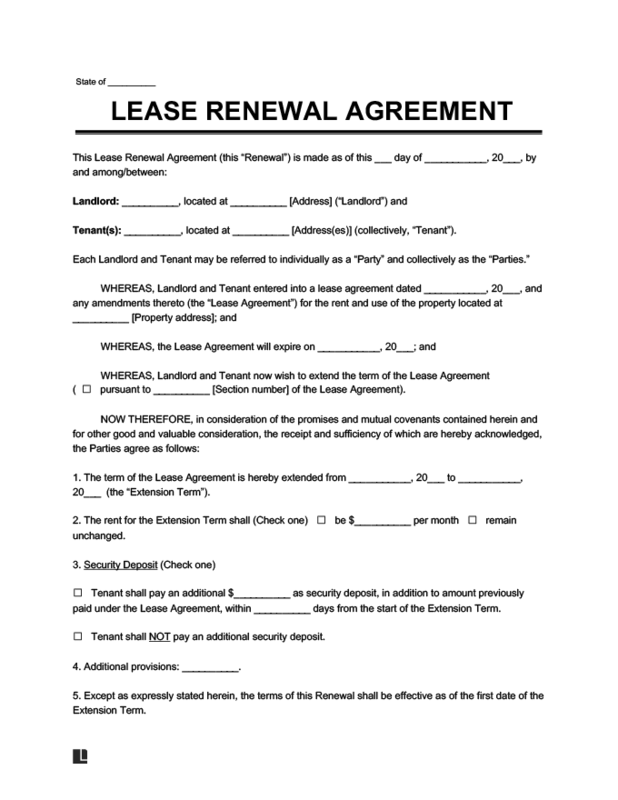 Don’t forget to attach or file your Lease Renewal Agreement with the original Lease Agreement. If you’ve found good tenants you want to keep on, you can use a Lease Renewal Agreement to easily renew the Lease Agreement. If your Lease Agreement is expiring soon, whether you are a landlord or a tenant, you will want to consider using a Lease Renewal Agreement as a quick and easy way to renew the agreement. Some Lease Agreements may even have an “option to renew” or “renewal option” that can be exercised by the tenant to extend the term. Landlords and tenants that have an existing relationship may trust each other and want to continue their relationship without renegotiating a full new Lease Agreement. The landlord knows that the tenant pays rent on time every month, does not cause a nuisance, and treats the property well. 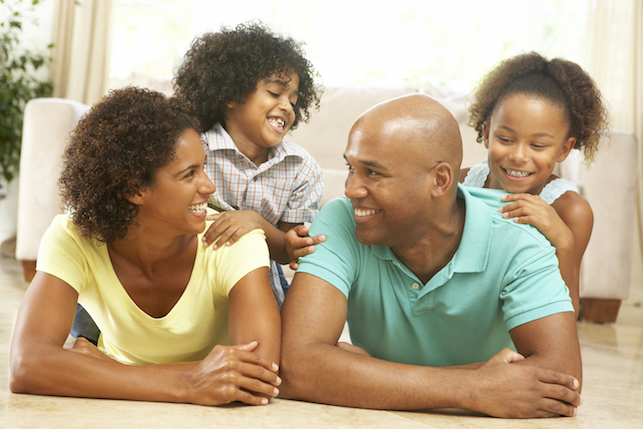 The tenant feels comfortable in the property and has made it a home, and doesn’t want to start over in a new place. By using a Lease Renewal Agreement, the parties can simply extend the expiration date of the lease, while keeping the other terms and conditions of the agreement in tact. If you are making a lot of amendments to the Lease Agreement, you may consider using a Lease Amendment instead. If a landlord or tenant wants to continue the lease past the expiration, without a Lease Renewal Agreement, the lease could turn into a month-to-month agreement. Under a month-to-month agreement, the landlord would be unable negotiate a higher monthly rent and would have the uncertainty of not knowing when the tenant might give notice and move out. And the tenant would not be able to negotiate having certain repairs made and would also have the uncertainty of not knowing when the landlord might deliver an Eviction Notice and make him or her move out. In addition, this agreement could save you a lot of time and money. As a landlord, you will save time and money by not having to market the property, pay for cleaning, hire painters, make repairs, and possibly have a lapse between lease terms where the property sits empty. As a tenant, you will save time and money by not having to search for a new apartment, pack up your belongings, hire movers, pay a broker, and possibly pay double rent for a number of days. In addition, if the landlord and the tenant have a good relationship, they can avoid of lot of hassle and anxiety of dealing with unknown parties.